Welcome to landscape design planning, which is the third part of our landscaping design series. This is a subject we have covered before on our site and felt it would be a valuable addition to the series. In the first section we talked all about you. Your taste, style, wants and needs in relation to how they will have to be balanced with the principles and guidelines of landscape design. In the second section we dealt with landscaping design Themes. This section will be all about outside influences that can affect your design. There are many things to consider with landscape design planning before you put a solid plan down on paper. There are restrictions on what you can and can't do and a lot of these restrictions come from outside influences. There are also things that may require you to relocate or modify features you want to install. Things like permits, bylaws, restrictive covenants and utilities can all affect the way you design your yard. Let's start off with a classic example. Fire pits are a “Hot” commodity and I have installed my share of them in backyards for clients. I have also had to let clients down with the disappointment that they either can't have one exactly where they want it, or can't have one at all. You'd be surprised at how upset some people get when they can't do what they want to their own yard. Many of us want a fire pit in our back yard, but are you aware of the regulations regarding the construction and use of them? 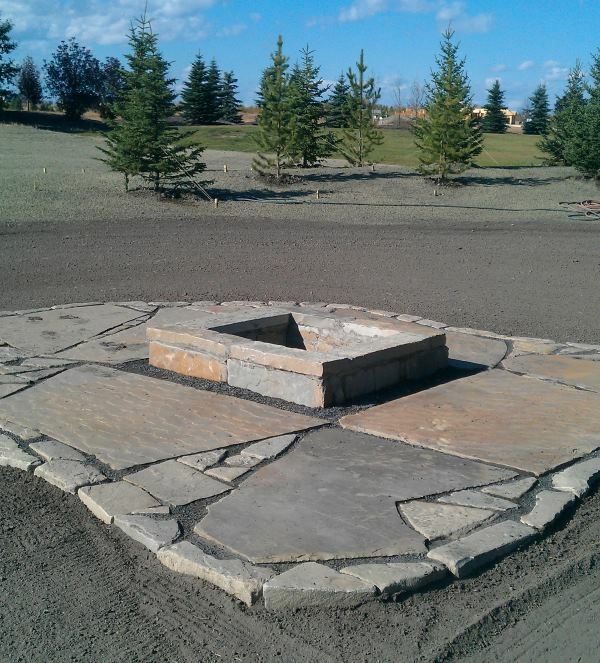 There are regulations and guidelines regarding fire pits in most towns and cities. Some cities and towns may have full bans against having them. Even when they are allowed, they usually have to be constructed a certain way. This means the base under them, the materials used to build them, but most importantly, the distance they need to be from other features like decks, trees, fences, houses. I have even seen regulations on the times you can use them similar to noise by-laws. These are usually decided on and enforced by the fire Marshall, but it could be different in your area. I advise clients to visit the local town or city websites to find out for themselves. Don't think you are exempt from these rules just because you live outside city limits either. I once built a fire pit on an acreage outside the city limits in a high end subdivision that had more strict laws than the city did. Telling someone with a $7,500,000 house on 2 acres that they couldn't have what they wanted created an outrage. I had to print off the county fire pit regulations and show it to the client because he doubted what I was telling him. He nearly blew a gasket when he saw the limits on the inside dimensions. The bottom line is before you have your heart set on putting something in your yard, make sure you know if you can have it, as well the rules regulations and codes that go along with it. Landscaping building codes and permits. Fences, decks and pools can have building codes to ensure they are constructed a certain way. Most people are aware of the codes for fences and decks, while they usually rely on the expertise of the installer to know the codes associated with a swimming pool. What many do-it-yourselfers don't know, is that cities can have codes for retaining walls over a certain height. People are also little surprised when they here there are things that may even require landscaping permits now. Be ready for this one, as it will likely be commonplace everywhere in the future. 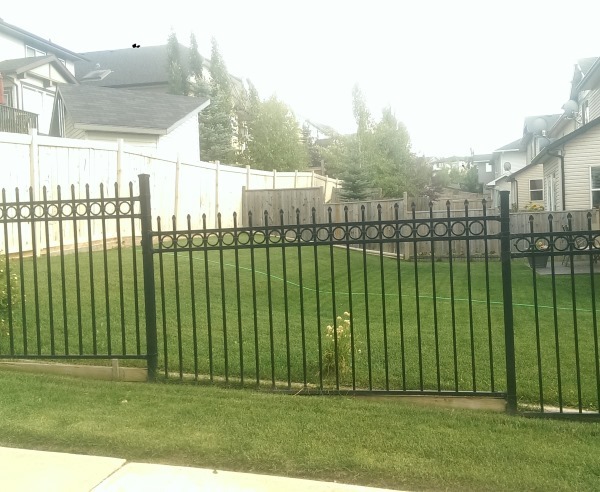 We are rarely able to choose the type and style of fence we want. These decisions are usually dictated to us by restrictive covenants and bylaws. 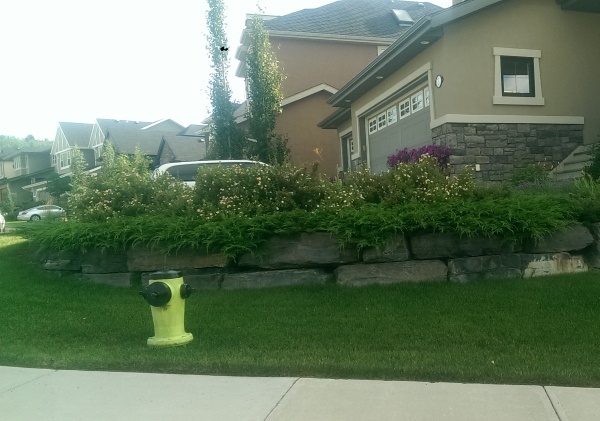 A simple low retaining wall is easy to construct right? Stack the stones, back fill with gravel, use some type of drain behind the wall. In my city, any retaining wall over four feet in height requires an engineered stamped plan and will have to be inspected. It is time consuming and costly. An engineered wall usually will have geotextiles or stabilization fabrics that secure the soil to the bank behind it. There is a way around this by building 2 lower walls instead of 1 large wall. Just make sure you have the right allowable distance between each wall. This is considered terracing, or tiers. It is a far less costly and time consuming option for those of you that are over the allowable height. I probably don't live in your city, so it's up to you to find out. The whole lesson here is make sure you are aware of local bylaw, codes, and building practices in your own area. If you need a permit, get it. The safest way to check is to make the call yourself. I have landscaped in a few cites and have had to do that myself. Never take anyone else's word for it, or you could find yourself ripping something up to remove it completely, or do it over again to a different specification. A common mistake in designing is drawing the eye towards utilities trying to hide them. Many times the more successful approach is adding a feature that draws the eye away from it. Utilities are another outside influence that can place landscaping restrictions on your design. There are many dangers when working around power, gas, electric, phone, cable, or other utilities. In our modern cities most of them are buried and are only an issue during excavation. If you have nothing in your design that requires you to dig, they won't be an issue. There may be limits as to what you are allowed to do around certain utilities as well. You may not even technically own the land. Some cities require a permit before making any changes to the land near the street. Remember it could be a right of way and that you may not even own it. I'm yet to landscape in any area that doesn't have either a “Call before you dig”, or a “Click before you dig” way to have utility lines marked. For the purposes of this article, “Call before you design” It may save you some disappointment. There is usually no charge for it and the response time varies. Someone will come out to your property (Usually within a week) and either spray inverted marking paint, stick flags in the ground, or both. There is a standard colour coding system used here in North America. Yellow- gas, orange- electric, green- water, white- telecommunications, red- fire services, and a few other less common ones. Other countries may be different, so you may want to use your Google skills to find out. There are also the overhead hazards to watch out for with the most dangerous one being power. The safe operating distance away from power lines is usually directly related to the operating voltage between conductors. Many places will require you to call the power company when working anywhere inside of a certain distance from the line so they can verify the voltage before you begin. Where I live in Alberta, that distance is 7 metres. If you're planting trees, consider how big they might grow. They could end up in power lines, eaves or roof tops. So these are some of the outside influences that could directly affect your plans. Make the calls you need to find out what will affect you. Here's a little recap of some of the more important points we covered. Find out if it's even allowed first before you decide to put it in your plan or design. Make sure you build it to the required specifications, or you may have to do it over again. Never take anyone's word for codes and permits. Make the call yourself. Make the call before you design if you have any features that require excavation. We mentioned before about covering this previously on our site. In this article we cover a few more things to look out for in the planning stages. Here is the link for Landscaping Planning.